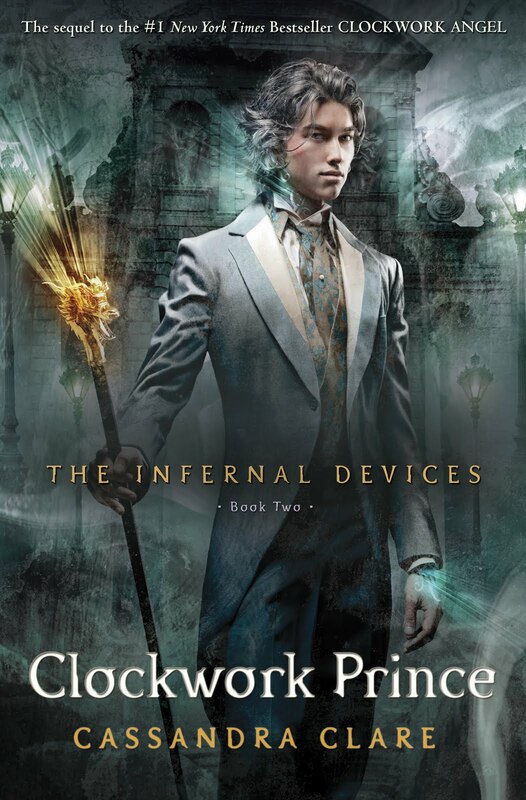 The second book of “The Infernal Devices“ is named “ClockorkPrince“. I know, that some people think that it’s a failure compared to the first one, but in my opinion, CP was much, much better. I’ve written down many notes and I’m going on with them in a minute, before that I’d just like to say that I’m glad I read the sequel, because the first one did not impress me that much and now I’m so looking forward to the third and final one (2013). So. On the love triangle. I wanted to cheer on Jem and I’m still keeping my fingers crossed for him I think. He’s so symathetic and human, caring, friendly. He’s a great friend material. He’s a great relationship material. Other than that, I cannot deny the butterflies in my stomach caused by William, not James. James is all one could ever wish for and any girl would be happy to have him, but it does not mean that there’s a Jem for everyone in the world. That special someone could be anyone. Someone, who understands you completely, who you feel comfortable even during silence and sho completes you. Who understands you without any words spoken out loud. Will and Tessa have that connection and as much as I do not want to admit it, they’re made for each other. Parallels from young adult fiction can be drawn from many relationships, Rose’s and Dimitri’s is one of them. They’re soulmates and although I l o v e Adrian, he’s not the one for Rose. Some of the reades think that Tessa’s weak and featherbrained, but I get her on some levels. She does not know why Will insults him all of the time and, at the same time, we, as readers, are inside of Williams head and know what he’s going trough. Tess doesn’t. Therefore, it’s hard to blame Theresa, because she cannot take the endless insults, she wants to move on. The last scene between only Tess and Will is heartreaking. On some levels I’m bothered because of the parallels between TMI and ID, such as Jace covering Clary’s body in order to keep her getting hurt from the collapse of the Wayland manor and Will covering Tessa with his body to keep her from dying. There’s more, but maybe it’s somehow related to them being relatives? No? Anyway, it’s disturbing and I’d like to read more original thoughts. Okay, I’m officially a fan girl. Really. Magnus Bane is the best part of the series. Tessa – what is she? What’s the deal with the clockwork angel Tessa’s wearing all the time? “Reparations,“ said Jem very suddenly, setting down the pen he was holding. “What’s the word for perfectly reasonable fear of annoying idiots?“ inquired Jessamine. “My aunt or yours?“ Jem inquired. “My talent is shape-shifting, Will, not acting,“ said Tessa, and at that, Jem laughed out loud. Will glared at him. I’ve put reading Cassandra Clare’s prequel to The Mortal Instruments off for a very long time. If you’ve read some of my previous reviews for TMI you know that I’m a huge fan of the series. 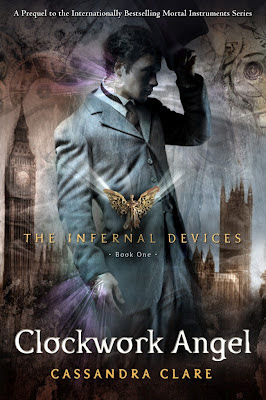 I was a bit sceptical about reading The Infernal Devices, because it’s a prequel (a series written after TMI, but the events take place before the events in TMI) and how can something, which takes place almost a century and a half before be better than TMI? The heading of the first book in TID series is “ClockworkAngel“. The events take place in the 19th century in London. The main characters are Theresa (Tessa), William (Will) and James (Jem), plus some othere important and less important characters. The beginnig of it was pretty intriguing, because in TMI Clary is a Shadowhunter, but Tessa’s not. She’s not quite human either. She’s a shapeshifter and is held hostage and prepared to marry the Magister. Tessa does not know that, of course, and thinks that she has to suffer and hear humiliation and shift by command in order to save her brother Nathan, who supposedly is being held hostage, too. The girl is saved by the Shadowhunters, but it’s not the end, it’s just the beginning. Other musings. At times, I felt like I was watching a Walt Disney cartoon, “The Beauty and the Beast“, to be exact, where Tessa was the Beauty and William was the Beast. Why? Tessa and Will are both bookfreaks. No, not nerds, but freaks! I thought I loved books, but I cannot quote all the books I’ve read. It’s not the only parallel. Tessa’s kind-hearted, bold and stands on her ground. Will, on the other hand, pushes everyone away (except Jem, who’s his parabatai) and is extremely mean towards Tessa. He’s also sarcastic and arrogant. Yes, one can tell that he really likes Tessa, but like the Beast, Will cannot let anyone in (except for Jem, who, by the way, is dying anyway). Jem plus Will plus Tessa equals the love triangle. What’s interesting about it is that Will and Jem are best friends for life; even more than that – they’re parabatai and in love with the very same girl. Neither of them knows about how the other one feels. Tessa falls for Will, obviously, but how he treats her is pretty bad and, at the same time, Jem is very sweet and kind. I think you get the picture. It’s difficult to imaigne the clockwork army. Funny, too. I didn’t excactly get what the point of them was – to bring down the Shadowworld, conquer England and then the whole world? I guess so. Anyway, I wasn’t sure who was behind all of this, but I had some ideas. It was an up-tempo book (if you don’t consider the beginning of it), but TMI left a bigger impression on me and the first book of TID was not as good as all the TMI books, therefore, I felt like there was something missing. Best thing about TID is Magnus, who, again, is one of the main characters and it’s great to read about him. Oh, and Demonpox and ducks are the favorite subject of Jem and Will to discuss. Will rolled up his sleeves. "We'll probably have to knock down the door--"
"Or," said Jem, reaching out and giving the knob a twist, "not." The door swung open onto a rectangle of darkness. "Now, that's simply laziness," said Will. Will: "Nice place to live, isn't it? Let's hope they left something behind other than filth. Forwarding addresses, a few severed limbs, a prostitute or two ..."
Jem: "Indeed. Perhaps, if we're fortunate, we can still catch syphilis." "Or demon pox," Will suggested cheerfully, trying the door under the stairs. “You know," Gabriel said, "there was once a time I thought we could be friends, Will." The City of Sin is a dream gig for a succubus, but Georgina's allies are suspicious. Why are the powers-that-be so eager to get her away from Seattleand from Seth? Georgina is one of Hell's most valuable assets, but if there's any way out of the succubus business she plans to take itno matter how much roadkill she leaves behind. She just hopes the casualties won't include the one man she's risking everything for. . . I think I’m not going to write about all of the books from this series separately, I’m just going to state all the things here. I liked the beginning of the series. The sequel was good. Loved the third and the fourth book. The fifth was not that good, it did not move me at all on any level and I wasn’t sure I wanted to read the last one. I’m glad I did, tho. The sixth book was different from the others. I thought that, throughout the series, the flow of the story was quite easy to figure out, but I was not expecting the things happening in the last book. At all. It was understandable and reasonable, because I could not figure out the connection between the men from Georgina’s past. I liked the conclusion and, although I feel like Mead could have told the story bettew, all the loose ends were connected and the ending was quite logical. In the last one, there was not that much action, but it was still cool. At times, I feel bad about reading all the books from the series right away, because in the next one the author always describes what happend in the previous one. It’s annoying to read it all over again. But, if I’d have to wait for the next book to come out for a year or so, I’d forget the details, too, so maybe it’s not so bad. In conculsion, it was an interesting series and I enjoyed Georgina’s relationship with her friends (Hugh, Peter, Cody) and Carter the most. Real friends are there even when their own perspective is not the greatest and one does not always have to fight on the same side to be there for someone. Even Bastian’s and Georgina’s sister-brother relationship was sweet and sincire. I started to look for excerpts, actually, but there were too, too many of them, so, yeah. There were so many good thoughts, sayings and scenes that made me laugh. There were a few, tho, which made me laugh out loud, but in each of these books there was an aphorism, which one should keep in mind. Unfortunately there were too many of them and I could not choose a few of them to write here. Rate to the last book and to the series in whole: 4. Succubus (n.) An alluring, shape-shifting demon who seduces and pleasures mortal men. Pathetic (adj.) A succubus with great shoes and no social life. See: Georgina Kincaid. I’ve read all of the books from Richelle Mead’s “Vampire Academy“ series and I must admit, it’s one of my favorites. I was a little sceptical about her second biggest series, but decided to give it a try and was pleasently suprised. Can this suave and loved young adult author write in a totally different style? It felt extremely weird at first and I feel like I got to know Richelle more as a writer. Succubus Blues: The story itself was good, up-tempo and over a long period of time I could keep my hands away from turning the pages and from spoiling the story for myself. This series about Georgina Kincad is definitely for a more mature reader than 15-17 year olds. It’s different, but good. I liked that the characters were more mature themselves and had more life experience, expected more from life than the teenagers and young adults I’ve been reading so much about lately. The use of tongue was a bit gruesome and savage at times, but made me smile at times to. There are lots of scenes to smile about, but none made me laugh out loud, unfortunately. Georgina’s name reminds me of the terrifying and hilarious Georgina Sparks from “Gossip Girl“, but the main character of “Succubus Blues“ is similar to her only by her determination and devotion. Georgina Kincaid, as Rose (TVA), is a strong, confident, humorous, caring and a diligent figure, who has a strong vision of her future. I felt for her, because she gave everything she wanted and cared for in order to make up for one mistake and has to pay for it throughout the eternity. I liked the writings between Georgina and Seth, it was sweet, because, yes, they met each other on daily basis, but in the writings they both were more sincire and Seth could open himself up thwough something he felt comfortable and at ease. It was a great start to the series. At times, very, very steamy.